Lawrence J. Crain | Greer, Burns & Crain, Ltd.
Lawrence Crain is a founding shareholder at Greer, Burns & Crain in Chicago, and is an attorney with unusually extensive experience counseling clients on the most efficient strategies and techniques for protecting their intellectual property. Larry assists GBC clients in obtaining patents — including provisional, non-provisional, design and utility — in the United States, as well as countries throughout the world. He also advises clients on all aspects of trademark law including word marks, designs or logos, and composite marks. In more than 25 years practicing intellectual property law, Larry has obtained over 400 U.S. patents, and many more foreign counterparts. GBC clients with international intellectual property portfolios and business interests benefit from the close contacts Larry has developed with patent and trademark associates around the world who provide GBC-style personal service. Among Larry’s international recognitions is his appointment as Queen’s Counsel by the Government of Canada. GBC clients asserting or defending intellectual property infringement allegations have consistently benefited from Larry’s experience in negotiation, licensing, and when necessary, litigation. 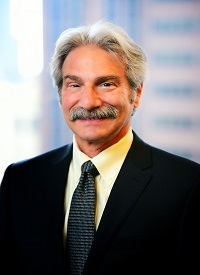 Larry’s achievements in IP law are exemplified by his repeated designation as Illinois Super Lawyer; his role as a Founding Member of the Richard Linn Inn of Court; and as a long-time Member of the Board of the Center For Intellectual Property Law and Information Technology at DePaul University College of Law. Larry was holds a B.S. in Biology and an M.S. in Entomology from the University of Illinois-Urbana, and a J.D. from Loyola University of Chicago School of Law. © Greer, Burns & Crain, Ltd.